Goals: To remember, honor, educate and inspire. The Memorial: The physical Memorial is a magnificent formation of 32 granite monuments bearing the inscribed names of more than 6000 veterans from 35 East Tennessee counties who have died in military service since the beginning of World War I. Names are listed by conflict and by county within those conflicts. The names and deeds of the 14 Medal of Honor recipients from East Tennessee are also inscribed and honored. 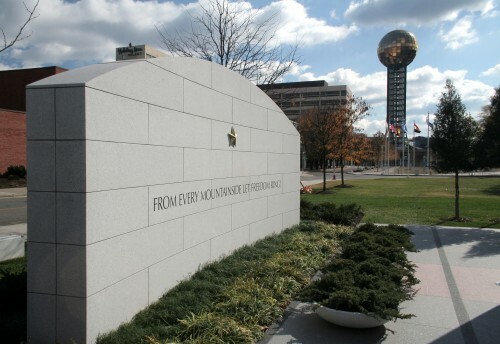 The Memorial is on a grassy plot at the northern end of Knoxville’s World’s Fair Park. Other features are a plaza entrance with a 50-foot flag pole and a 27-foot high bell tower. Funding Sources: Knox County Commission appropriated $1.25 million and Congress approved $475,000. The City of Knoxville provided the land. A state of Tennessee appropriation of $500,000 was also secured. The balance will come from a private fund drive now underway. Geography: The 35 counties included in the East Tennessee Veterans Memorial project are Anderson, Bledsoe, Blount, Bradley, Campbell, Claiborne, Carter, Cocke, Cumberland, Fentress, Grainger, Greene, Hancock, Hamilton, Hamblen, Hawkins, Jefferson, Johnson, Knox, Loudon, Marion, McMinn, Meigs, Monroe, Morgan, Polk, Rhea, Roane, Scott, Sequatchie, Sevier, Sullivan , Unicoi, Union and Washington. Please join us today with your contribution of your talents, funds, and your support, so that we may permanently honor those who made the supreme sacrifice for our freedoms.